We report the characteristics of the three-dimensional, time evolving, atmospheric boundary layer that develops beneath an idealised, dry, baroclinic weather system. The boundary-layer structure is forced by thermal advection associated with the weather system. Large positive heat fluxes behind the cold front drive a vigorous convective boundary layer, whereas moderate negative heat fluxes in the warm sector between the cold and warm fronts generate shallow, stably stratified or neutral boundary layers. The forcing of the boundary-layer structure is quantified by forming an Eulerian mass budget integrated over the depth of the boundary layer. The mass budget indicates that tropospheric air is entrained into the boundary layer both in the vicinity of the high-pressure centre, and behind the cold front. It is then transported horizontally within the boundary layer and converges towards the cyclone’s warm sector, whence it is ventilated out into the troposphere. 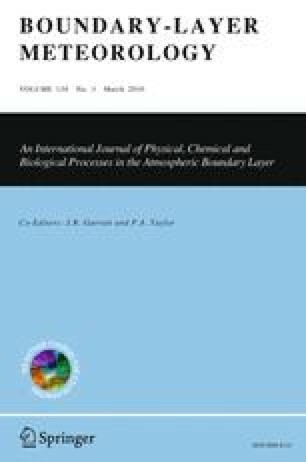 This cycling of air is likely to be important for the ventilation of pollution out of the boundary layer, and for the transformation of the properties of large-scale air masses.